You can make a positive difference today! Our work with local animal shelters will pair veterans with a free pet, so they can more easily deal with PTSD, helping to heal the deep emotional scars, and possible save their lives. All of our veterans need some level of help, whether they admit it or not… And whether or not they show any symptoms of PTSD or other emotional issues. Vets have sacrificed their well-being for us and our country, and now it’s our turn to help them in return! This is our way to give back so they can enjoy the level of joy and happiness they deserve, and get their own life back… One a companion pet can offer. And believe me, there are many pets that need a great home in the Seacoast N.H. area. 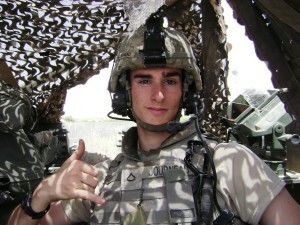 This fund is created in honor of Christopher Journeau for PTSD awareness. Chris served with the US ARMY, 1st Battalion, 21st Infantry, 2nd Stryker Brigade Combat Team while fighting in Operation Iraqi Freedom. At the age of 23 and six months after his return home to Stratham, NH, he took his own life. The end result was he had been suffering from PTSD and nobody knew it until it was too late. Due to the overwhelming response to this program, Chris’ Pets For Vets will adopt out 1 pet, 1 time to any current or former military! Effective June 1, 2016 we are reinstating Cocheco Valley Humane Society’s veteran adoption assistance to 100%! Thank you for your support in making this possible. NHSPCA and Manchester Animal Shelter will remain suspended until further funding can be obtained. Thanks you for your patience and understanding. Please donate today!